Dissatisfied with progress on govt assurances, the farmers want to reiterate the demands they had voiced last year when they walked from Nashik to Mumbai. Mumbai: Maharashtra’s farmers are preparing to march to capital Mumbai again, because they are dissatisfied with the progress on the assurances the state government had given them last year. However, as they prepare to march this time, the organisers allege that the hurdles they are expecting to face are not restricted to potential blisters on their feet, sleepless nights, and lost work days. They have been denied permission to march till Mumbai, and are only allowed to demonstrate in Nashik, police said. In March 2018, over six days, more than 30,000 distressed farmers walked 170 kilometres from Nashik to Mumbai in a peaceful march meant to get their demands, including debt relief, heard. On the day they reached Mumbai, the farmers were met by a ministerial panel formed by the Devendra Fadnavis-led BJP-Shiv Sena government, which gave them a written assurance that their demands would be met. But the farmers are unhappy with the progress made by the government in the last 11 months. This year’s protest was scheduled to begin at 4 pm Wednesday, but organisers claimed a number of participating farmers were stopped by the police in their respective districts, to prevent them from reaching Nashik, the starting point. They said they eventually delayed the march, waiting for their arrival. 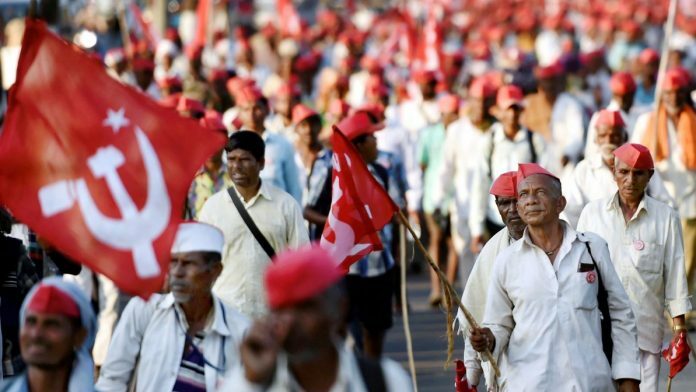 The long march encore is being organised by the Communist Party of India (Marxist)-affiliated All India Kisan Sabha (AIKS), which also spearheaded last year’s stir. Criticised for reacting to farmers’ anguish very late during last year’s long march, Chief Minister Devendra Fadnavis Sunday met AIKS members to discuss farmers’ demands. However, dissatisfied with the CM’s assurances, the AIKS decided to continue with the long march, which is scheduled to reach Mumbai on 27 February while the budget session of the legislature is underway, similar to last year. Speaking to ThePrint, AIKS national president Ashok Dhawale said “the farmers are angry and we are expecting a much higher turnout this time”. “But the administration is preventing our people from taking part in the agitation,” he said. “Nearly 1,000-1,500 farmers from the Thane-Palghar region were prevented from leaving for the march citing law and order issues. We are not going to take it lying down. We will carry on with our march as peacefully as last time. Sangharsh hoil (there will be an agitation),” he added. However, Maharashtra’s minister of state for home (rural) Deepak Kesarkar said the government had no role to play in denying farmers permission to march. “They have been given permission to demonstrate in Nashik and they have been given permission to enter Mumbai,” he said. The AIKS cites three main triggers for the long march. First, the farmers want to reiterate the demands they made last year: Proper execution of the state’s promised farm loan waiver, the implementation of the recommendations of the M.S. Swaminathan commission, which included an assured minimum support price 1.5 times the cultivation costs, and the transfer of forest land to the tribals who have cultivated it for years. Second, the farmers want effective relief for Maharashtra’s drought-hit regions, which cover nearly half the state. Third, the march is being projected as a culmination of five farmers’ agitations in Maharashtra since 2016, to protest against the “empty promises of the Narendra Modi-led government” at the Centre, Dhawale added. “Before being elected Prime Minister, Modi held 440 sabhas where he promised to implement recommendations of the Swaminathan commission and give farmers 1.5 times production cost as the minimum support price,” the AIKS leader said. “Although the government has implemented this, the calculation is not in keeping with the commission’s recommendations and farmers end up earning much less.